Jennifer Cluff: Denis Bouriakov might just blow your tiny mind! Denis Bouriakov might just blow your tiny mind! "Jen, You may like to check out D. Bouriakov's playing. I really like it." Well thanks for the recommendation....as it just about blew my excellent tiny mind! You will be amazed to find that this 26 yr. old has just broken a new world's flute record for brilliance! I for one, downloaded all the tracks, and burned them to a CD for repeated listenings. He also plays Schubert, Mozart and Jolivet. All for free download. Yes, our minds will never be the same. In the comments we were discussing Bouriakov's unique offset embouchure and whether or not he uses the much maligned "smile muscles". Jury is still out. Check out these amazing close ups in the videos on note bending below. This is really phantastic flute playing. I found the same problem. One cannot right-click on the sound files, but has to re-record them using a recording software as they play. So I used the freeware programme we have called AUDACITY (from Soundforge) and set it to "Wave-out-mix" and pressed record. Then I played the file to check the recording levels (level 1-2; very low levels to prevent peaking), and then I let it run until each piece finished, and saved the Audacity sound file as an mp3. If anyone else has an easier way to do it, let me know. the longer I hear him, the more I can understand your opinion. He is a flute magician. his flashsite is for computer professionals, hahaha! The first (!) file is mp3 and opens in Quiktime (how awful!) and then you can download by right click and save as ... then you have to go back. The other files "work" much better, they are *.wma and download easily just by clicking on them. Ooooh! My first remark? Very shiny...I like!!!!!! JenCluff - You make me laugh! Jen's lighthearted flutey wisdom imparted through her blog is so much fun to read, and I always learn something new. Her words inspire me to aim high in my musical studies, and to try these new things on the flute. Be it a new flute player, whose notes ring clear in the air, or another flutish warm-up, it's always worth reading. Thank you for the encouragement and inspiration, Jen! The Chant de linos took my breath away!!!!!! Hello to the person who just suggested a Windows Media Player saving method: There is no tab called FILE on my WMP. There is Rip, Sync, Library and none of them actually save the mp3. How do I get a Wind.Mediaplayer that has FILE on it? Hi to the Russian flutist who just wrote about lining up the flute. I knew him since he held the infamous Bouriakov free sheets site (now down since months ago)...when I discovered he's one of the most talentuos flutists over the world, I were amazed. And his Chant de Linos...the best I ever heard. While browsing through your marvelous site, I ran into the link to Bouriakov mp3. I have discovered him 3 months ago, while looking through a list of competitors at the Jean-Pierre Rampal competition, to see what became of them after. I really fell in love with his playing so, in the end, I just want to say that I respect you and the work you did with this site so much. 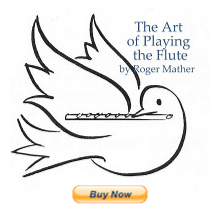 It trully is a place to find quality flute links and articles. Thankyou Victor. What a kind and lovely comment. I appreciate your taking the time to write. Yes, The Metropolitan Opera orchestra; two new co-principal flutists. Good job Denis! does anyone know what flute he plays on?? May I ask where you ordered the transcriptions of the chaconne from? I ordered from www.fluteworld.com but unfortunately, even with a D minor transcription, a whole lot of work is needed to transpose workably into G minor. Hours and hours of work transposing. Hopefully Bouriakov will make his version available at some point. Apparently it's released under creative commons by the arranger himself, so shouldn't be any copyright problems. I've been playing it for a while and it seems to be very similar to the version Bouriakov plays and doesn't need transposing. He has Galway's expressiveness coupled with a Rampal-like sweetness. Charming flute playing, for sure. He's such an incredible flutist! I find his embouchure fascinating, as it goes against all of the usual advice. It's as far off to the left side as I've ever seen...but we know a lot of good flutists play off to that side (I don't think I've seen anyone with an embouchure off to the right side). His flute is often not parallel with his lips, but droops downward. And he also plays with a marked smile (which you can see in his youtube videos on note bending and in action here: https://www.youtube.com/watch?v=xrujUOgSPYA). But he's so good that it's obvious these things work for him. I'm thinking I might adopt a more "if it works, don't fix it" attitude. I know! Thanks for bringing this up, Anonymous! I've always wondered if it's the arrangement of teeth that causes someone to choose offset to the left. As described in Mather's books, offset to the right causes arm discomfort, so few try it. But if anyone can ask Denis about this, I'd love to know. Does he have a crowded bottom row of teeth that precludes centering. Curious. Hello again Anonyous from Feb 11th 2018! I watched the video and added it above, to the blog. I don't agree that the side of his mouth we can see is necessarily in a "smile". I'm comparing it to the Gilbert photos in "The Gilbert Legacy". The corners are not pulled upward, but are parallel to the chin line. And arms are not too too too droopy. I've seen droopier. hahhahaa. I'll search for smiling photos. Meanwhile, someone please ask Denis about offset embouchure and report back! :>) He's in L.A. !